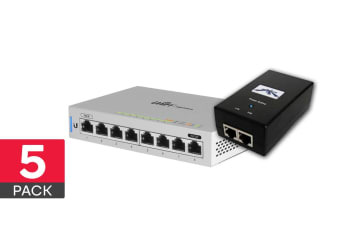 The UniFi Switch 8-port models feature Gigabit Ethernet ports in a compact form factor. The US-8 is a PoE Powered 8-port gigabit switch with PoE Passthrough. Perfect for cleanly adding Ethernet ports where needed, with passthrough to keep your PoE device powered.